How to get there This pass can be reached by taking the Ötztaler Gletscherstraße (Glacier road) that leaves off the main road in Austrian Ötztal just after Sölden (1418m) or before, if you come from Italy and Timmelsjoch/Passo del Rombo (2474m). One could also start further up north at Oetz (781m). One continues up until one reaches a toll station (do not take off to Hochsölden (2099m)! (also a hard climb)). The road is free for bicyclists. Here it is starting to get steeper – up to around 13% for long stretches. 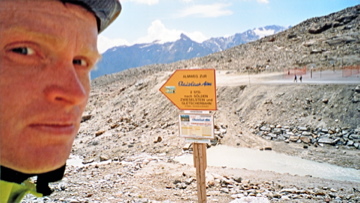 At a junction at around 2500m height, the main road (the Rettenbach Gletscherstraße) continues to a parking place at 2800m and then a harsh gravel road continues up toward Pitztaler Jöchl (it may end before the pass). You should go left up the Tiefenbach Gletscherstraße. Soon you come to a long tunnel that goes under the real Seiter Jöchl. The tunnel is having a 8% constant slope with not too good surface and is often wet (look out for ice). The tunnel is lit and reaches 2820m at the entrance on the other side. The road goes down to a parking. There is only a path going down this side of the mountainside to Ventertal. The tunnel can sometimes be closed even in Summer. Breathing is a bit hard in the tunnel. The views on the other side are fine, but the small ski resort with tennis courts is looking rather lacklustre. At 2820m this is the highest asphalted road in the Alps. Fill up your water bottle in Sölden. There is a restaurant at 2660m on the Rettenbach road and the ski resort after the tunnel may offer refreshments and food. The path leading down to Gaislach Alm looks inviting (if walking), but also very steep (one cannot see where it goes at all). The steepness profile at salite.ch might be interesting.